"Rome With Isy " is a private tour dedicated to families with kids. A beautiful itinerary of the most important squares and fountains in Rome with a special guest virtually joining your party, our mascot Isy, the sweetest puppy in the world! Eternal City and take part in a gelato blind tasting. 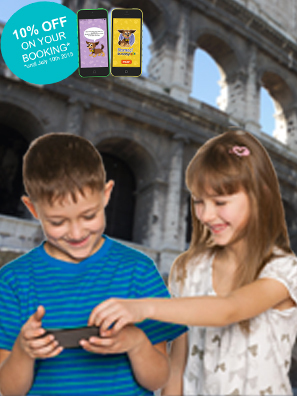 Enjoy the explanations of your knowledgeable tour guide, while through the use of an App your kids are going to have fun and learn about Rome in a new and interactive way: solve the riddles and win a little prize!